Got a new iPhone X/8/7 and wondering how to transfer contacts from old iPhone to the new device? The common ways are iCloud sync and iTunes restore. However, not all the contacts will be synced to the new iPhone. You may lose some important contacts during iCloud syncing. Also, restoring from iTunes backup will erase all the existing data on your new iPhone. In this blog, we’ll show you two quick and easy ways to copy iPhone contacts from old iPhone SE/6 Plus/5s/4 to the new iPhone X/8/7 without iTunes or iCloud. Want to find a simple and direct way to transfer contacts from iPhone to iPhone? 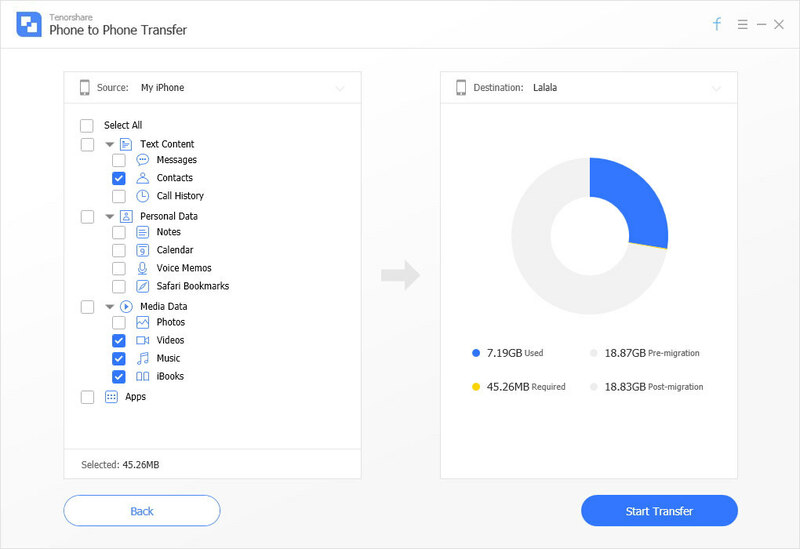 You can use the best app – iTransGo which is able to transfer all the content on your iPhone or selectively to transfer contacts only to another device. And this program can also transfer music, iBook, app data or other files from any device to another without the help of iTunes and iCloud. Download and install this amazing program to see how it works. Step 1. Open iTransGo on your PC/Mac, connect your two iPhones or iPhone and iPad to computer via USB cable. iTransGo will detect your devices automatically. Click “Next”. Step 2. Select contacts only contents or other data types you want to move contacts from iPhone to another and click “Start Transfer”. Step 3. Wait a few minutes. The contacts on your old iPhone will be transferred to your new iPhone successfully. Using Gmail is another convenient method to transfer contacts from iPhone to iPhone without iCloud. And here are the steps. Step 1: Import contacts from old iPhone to Gmail account: Go to “Settings” on your iPhone, select “Mail, Contacts, Calendar” option and click on “Import Sim Contacts”. Select your Gmail account to get your iPhone contacts imported to the Gmail account. 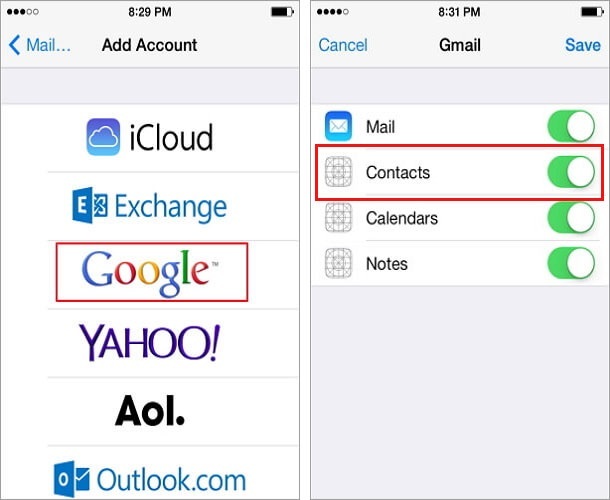 Step 2: Copy contacts from Gmail account to new iPhone: Go “Settings” >> “Contacts” >> “Account” >> “Add Accounts” >> “Google”, enter your Gmail account E-mail address and the password >> “Next” >> Turn on “Contacts” >> “Save”. After that, your contacts in the Gmail account will be exported to the new device. 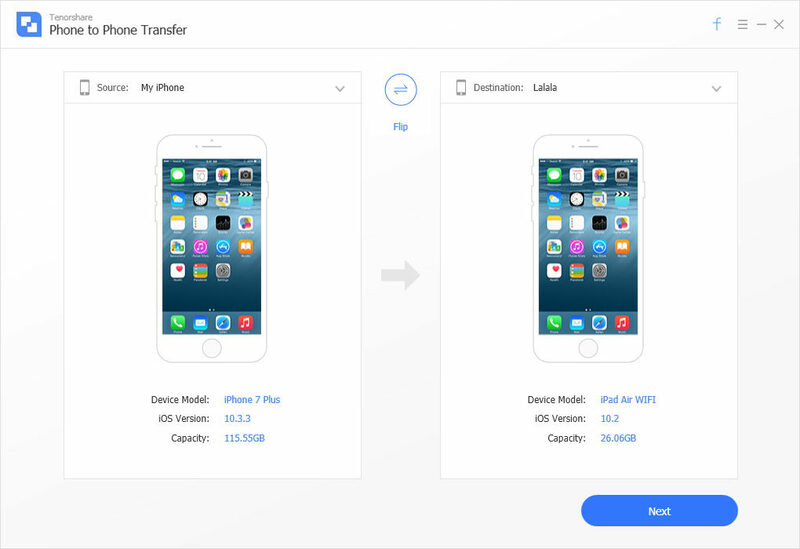 This blog has shown you 2 effective ways to transfer contacts from one iPhone to another iPhone/iPad without iTunes/iCloud. Hope it is helpful for you. Any further concerns, just feel free to do comments below.